I was an active food writer throughout the 1980s and 90s. 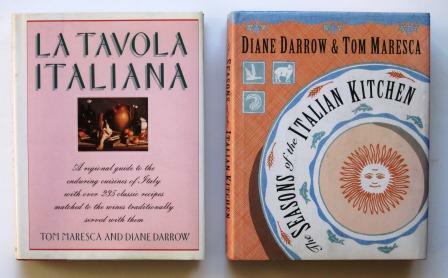 My husband, Tom Maresca, and I co-authored two books on Italian food, wine, and dining: La Tavola Italiana and The Seasons of the Italian Kitchen. Later, Tom and I moved into the electronic publishing world, with a mini e-cookbook, Not the Same Old Spaghetti Sauce, and a digital version of The Seasons of the Italian Kitchen. I’ve been a columnist and contributing editor for Long Island Newsday, Time-Life’s Great Meals in Minutes series, the Los Angeles Times Syndicate’s FoodStyles feature service, Birnbaum’s France, and Warner Audio Publishing Company. I’ve had articles published in Bon Appetit, Food & Wine, The New York Daily News, The Journal of Gastronomy, Saveur, Wine & Spirits, and Wine News. I’ve done consulting and made presentations for the New School Culinary Arts Program, the TV Food Network, the Italian Government Trade Commission, and both the Center for Continuing Education and the Center for Italian Studies at SUNY at Stony Brook. But before, during, and after all that, I kept my day jobs. I spent 30 years as an editor for several international consulting firms. Earlier, I was a university teacher and administrator, with a PhD in literature from the University of California. Since I retired I’ve done volunteer work for The Morgan Library & Museum, City Harvest, New York City Audubon, the High Line, Project Gutenberg, and both a soup kitchen and a community garden in my Greenwich Village neighborhood. Tom and I still cook all the time for ourselves, family, and friends. Terrific new blog! I like having a great cook whose opinion I trust trying out recipes I might never get around to. Thanks for the recommendations. I will look forward to future posts. Diane, I’ve met Michele and Charles and now am happy to have been “introduced” to you. I love this blog and have saved it for reference. Thanks, Carol. I just took a look at your website and liked it too. I feel the same way about Rome as you do — my favorite city in the world (other than the one I live in)! Hi. I just found your website. It looks great. My husband and I live in Florida but are originally from Long Island. Look on http://www.abebooks.fr. There are several listings for the title. I was watching on TV the new Montalbano episode also Camilleri was in interview and they where eating pasta ncatasciata ! So wanting to share I found you and I am very happy , congratulations you arew great !!!!!!!! Yes, pasta ‘ncasciata figures in many of the Montalbano tales. For the post I did on it, the dish didn’t come out as well as I’d hoped, so I plan to make another try at it, very soon.